SHOW IS COMPLETELY SOLD OUT! Saturday Sept. 20, 2 p.m. Is SOLD OUT! Sunday Sept. 21, 2 p.m. is SOLD OUT! Saturday Sept. 20, 6PM is SOLD OUT ! "Maayajaal" - a dance production! 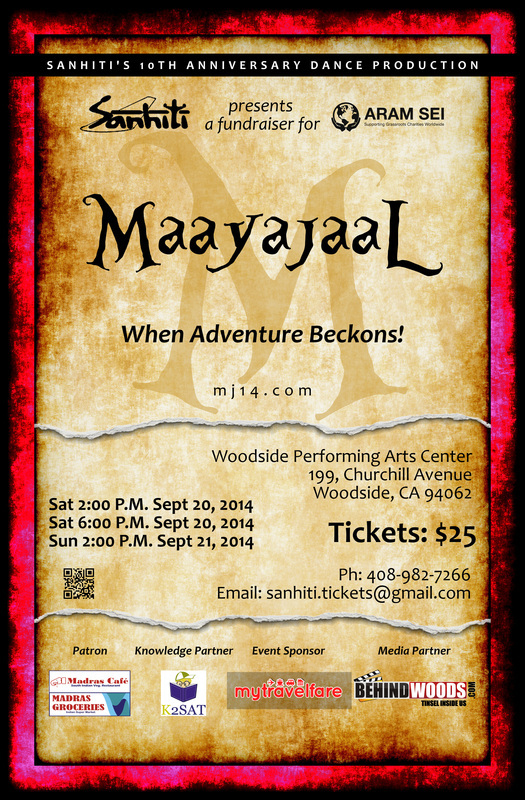 presents "Maayajaal", its 10th anniversary production. As before, the show is a grand dance production, set to mostly South Indian movie songs. “Maayajaal” is a magical journey of illusions portrayed through a skillful combination of dances and stage sets. What will you do when adventure beckons? Will you fall into the web of illusions or keep away from its clutches? We hope you will be amazed and enthralled by the production, at the same time knowing that your support goes to a great cause! Sept. 20, 2014 @ 2 P.M.
Sept. 20, 2014 @ 6 P.M.
Sept. 21, 2014 @ 2 P.M.
Aram Sei supports grassroots charities worldwide in the areas of education and healthcare. This year, Aram Sei aims to support over 100 HIV+ children in India and over 200 sexual assault victims in California. All proceeds from Maayajaal will support Aram Sei projects. Visit www.aramsei.org for more information.